16. פָּתַח וְאָמַר, רוֹעֶה הַנֶּאֱמָן, הַכַּלָּה הַזּוֹ שֶׁלְּךָ נָתַן אוֹתָהּ הַקָּדוֹשׁ בָּרוּךְ הוּא לְאַבְרָהָם לְגַדְּלָהּ אֵלֶיךָ, וּמִשּׁוּם שֶׁהוּא שָׁמַר אוֹתָהּ, נִקְרְאָה בִתּוֹ, זֶהוּ שֶׁכָּתוּב בַּת הָיְתָה לוֹ לְאַבְרָהָם וּבַכֹּל שְׁמָהּ. וּבָהּ קִיֵּם כָּל הַתּוֹרָה כֻּלָּהּ, וַאֲפִלּוּ עֵרוּבֵי תַבְשִׁילִין, זֶהוּ שֶׁכָּתוּב (בראשית כו) וַיִּשְׁמֹר מִשְׁמַרְתִּי וְגוֹ’. וְהוּא הָיָה אוֹמֵן אֵלֶיהָ, כְּמוֹ (אסתר ב) וַיְהִי אֹמֵן אֶת הֲדַסָּה. וְהַקָּדוֹשׁ בָּרוּךְ הוּא בֵּרַךְ אוֹתוֹ בִּגְלָלָהּ, זֶהוּ שֶׁכָּתוּב (בראשית כד) וַה’ בֵּרַךְ אֶת אַבְרָהָם בַּכֹּל. וְגִדְּלָהּ מִכָּל טוֹבוֹת טוֹבוֹת, וְגָמַל עִמָּהּ חֶסֶד, וְהֶעֱלָה אוֹתוֹ בִּגְדֻלָּה בְּמִדַּת חֶסֶד שֶׁל אַבְרָהָם, וְהָיָה בֵּיתוֹ בִּגְלָלָהּ פָּתוּחַ לִרְוָחָה, לִגְמֹל חֶסֶד עִם כָּל בָּאֵי עוֹלָם. 17. וּמִשּׁוּם שֶׁהוּא גָּמַל עִמָּהּ חֶסֶד, כְּשֶׁבְּנֵי אַבְרָהָם הָיוּ מְמֻשְׁכָּנִים בְּכַמָּה חֲטָאִים בְּמִצְרַיִם, אָמַר לְךָ הַקָּדוֹשׁ בָּרוּךְ הוּא: רוֹעֶה הַנֶּאֱמָן, לֵךְ וּגְמֹל טוֹבוֹת לְמִי שֶׁגָּמַל עִמְּךָ, שֶׁהֲרֵי הַכַּלָּה שֶׁלְּךָ נָתַתִּי לוֹ אוֹתָהּ לְגַדְּלָהּ בְּמִדּוֹת טוֹבוֹת, וְהוּא גִּדְּלָהּ בִּשְׁלֹשׁ עֶשְׂרֵה מִדּוֹת הָרַחֲמִים שֶׁרְמוּזוֹת בְּשָׁלֹשׁ תֵּבוֹת וָה”וּ אֲנִ”י וָה”וּ, שֶׁהֵן וָא”ו, שֶׁכְּלוּלִים בָּהֶן שִׁבְעִים וּשְׁנַיִם שֵׁמוֹת כְּמִנְיַן חֶסֶד, שֶׁבָּהֶם הָיָה מִתְגַּבֵּר אַבְרָהָם עַל שִׁבְעִים וּשְׁתַּיִם אֻמּוֹת, וּבַכַּלָּה שֶׁלְּךָ הָיָה לוֹ סְגֻלָּה בְּשִׁבְעִים וּשְׁנַיִם שֵׁמוֹת, וְהָיָה מְנַצֵּחַ כָּל אֻמָּה וְלָשׁוֹן. The ‘Faithful Shepherd’, Moses, reveals that Abraham was blessed with a daughter and her name was ‘בַּכֹּל’ (pronounced ‘Bakol’), which translated in the verse above as ‘in every way’. Numerical value is 52, same as the name of YHVH that represent the level of Malchut יוד-הה-וו-הה. The daughter was Malchut and Abraham as Chessed could make connection to Malchut. Abraham was Chessed and spiritually higher. God blessed him with the ability to connect to Malchut and channel Chessed to all the levels below. He opened his ‘home’ of Chessed to all directions inviting everyone on the lower levels to his home and be blessed with Chessed. The Chessed that Abraham channeled to Malchut rewarded his descendant (the Israelites in Egypt) with Chessed from God. Abraham’s actions drew the 13 attributes of mercy to Malchut. The Zohar reveals that they are concealed in the initials of the three words והו אני והו, Vav Alef Vav ואו. They are the initials of three names from the 72. 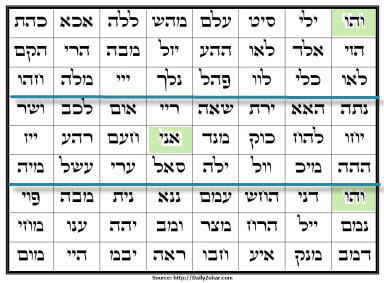 The first letter Vav comes from the first name והו, the Alef is for the middle one (pos 37) אני and the third Vav is for והו name that begins the third part (pos 49). There are three parts with 24 names in each to represent the three column system. The numerical value of Chessed is 72 as the number of special names. Abraham used them to be stronger than the 70 nations, Esau and Ishmael, and overcome their negativity. I strongly suggest not to use individual names from the 72 names as powerful ‘angels’ to support your personal (mostly selfish) desires. This is idol worshipping. Do not post on Facebook or tattoo it on your skin! There are few names that can be meditated upon individually but the entire table must be used to support the meditation. The 72 names come from three verses in the Torah (portion of Beshalach) and taking them out as separate unit breaks the supporting energy of the proximity by letters. As we studied in this and previous DZ studies, Chessed comes from the entire 72 names. Those who misuse the names draw serious judgments into their lives. Jewelry with names are made to make money and the consciousness embedded in them in most cases is profit, not Chessed. I saw a friend wearing the name ערי on the neck but the letters were in reverse ירע. Those who read and understand Hebrew know that ירע means ‘bad/evil will come’. 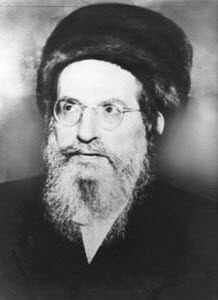 One of the safe names to meditate on is מהש. When you meditate on it to draw healing for yourself and others, scan the entire table to get the full support of the 72 names. Feel free to use this chart of the 72 names to print and post in your home and or office. It’s free for all and you can use and send to all your friends. You can also use print services to enlarge and print on any quality material for framing, laminating, etc. As long as you keep the entire chart, you are connected to Chessed. Place the chart on the wall in a clean and good place. If anyone has a better design of the 72 names and wishes to share with Daily Zohar students around the world, they can email me and I will post it on the Daily Zohar for free sharing. There is a great merit in sharing spiritual tools with others. When they use it you are spiritually connected with them and earn Light “points”.